Above: Trash Orchestra performs on Pacific Garden Mall in Santa Cruz. Rico Thunder (left) with Ryan Geiss, inventor of the Wrenchstrument. Made of: Rusted, dented, surplus-sized aluminum food cans, each tuned to a different note. Sounds like: "Something between a xylophone and a steel drum." Made of: Trashed or secondhand wrenches of a variety of sizes, which are struck with a metal or wooden implement. The differing sizes and shapes created two different octaves. Sounds like: Somewhere between a cowbell and a keyboard. Name: Untitled (we suggest "The Brastrument"), created by Whitney Wilde. Made of: Two aluminum bowls, cut and shaped into a wearable bra top, attached with twine. Sounds like: Thin, tinny percussion, depending on which area of the bowl is struck. Name: The Big Blue Barrel. Made of: A salvaged plastic industrial container, turned upside down and fitted with a strap so it serves as a portable bass drum. Sounds like: "Since it doesn't have a drum skin, musically this acts more like a bell than a drum." Made of: A rectangular recycling bin from Morgan Hill. Sounds like: All-purpose drum, used in conjunction with the Big Blue Barrel. Rico Thunder is preparing to tune his instrument. Brows furrowed in concentration, he pushes his curly brown hair out of his eyes, shielding the blinding sun that casts down on him. As he stands on the top level of a parking garage in Santa Cruz, he lifts his musical accoutrement, inspecting its sonic nooks and crannies as they wink in the sunlight. A fellow musician hands him the makeshift tuning device: a rusty, bludgeoned hammer - clearly on its last leg. Thunder positions his instrument, wielding the hammer. The head of the hammer flies off, bouncing on the ground and leaving a trail of rust flakes on the concrete, narrowly missing a fellow musician's foot. Thunder shrugs and hoists up his instrument: a crumpled, battered aluminum pan. He gives the signal, and immediately his compatriots, a handful of men and women of varying ages, break into "song" - a pulsing, amorphous wall of sound emanating from a rag-tag collection a recycling bins, hubcaps, decrepit tools, bent wire, and salvaged industrial scrap. Just another day in the aural adventures of the Trash Orchestra. 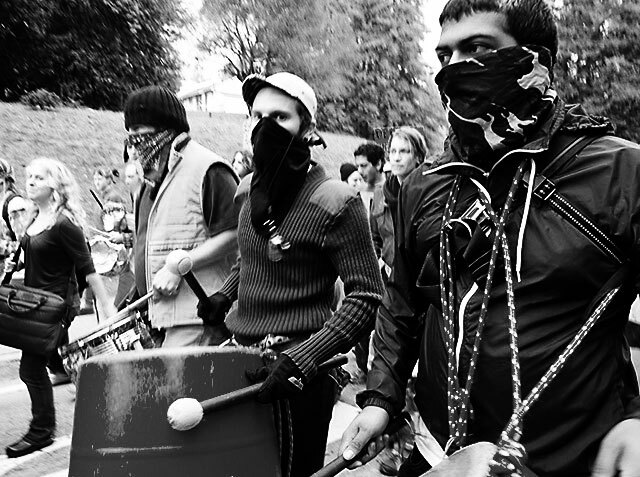 Founded in 2005, Trash Orchestra is a cacophonic, organic, artistic and anarchistic experiment in noise, music, recycling and community. The premise is simple: salvaging pieces of trash, and turning them into musical instruments. But the meaning behind the group is steeped in social awareness and activism - with a healthy dose of good ol' fashioned fun. Most members have little or no musical experience, and are of diverse ages and backgrounds: students, engineers, self-employed business people, and artists. They're united by a few basic ideas: the desire to create noise and art, the notion of challenging what constitutes public space, and questioning what exactly is "trash" and why our culture creates so much of it. Delving into philosophies ranging from anarchism to freeganism, Trash Orchestra quietly raises political, social and ecological issues - while making one hell of a noisy, catchy, delightfully chaotic din. Trash Orchestra first began as a part of the Last Night Parade in Santa Cruz on New Year's Eve 2005, genially thrown together in a non-organized, non-structured manner. Though the collective has grown since its humble beginnings, the fly-by-the-seat-of-your-thrift-store-pants mentality has remained. A fluid group, there are a few basic parameters, but nothing is set in stone - and they like it that way. The Orchestra practices (mostly) every Sunday in Santa Cruz at various locations, often walking down to Pacific Avenue to engage in a public performances where bystanders are encouraged to participate. The only requirement to join (aside from the optional tetanus shot) is a thirst for creativity and a love of music and experimentation. One of the group's fundamental principles is that no one person is in charge. Thunder, 40, is a carpenter and artist, and one of the co-founders of the group. He stresses that Trash Orchestra is a collective in every sense of the word. "It's an explicitly radical, non-authoritarian group," he says. "It's a bunch of people who got together and made it happen." Thunder says it's also been difficult for many people to grasp the concept of no central leader. "It's really challenging for folks who are in hierarchal organizations," he says. "We all lead this, but instead of just window dressing that's actually true. That's one of the most interesting things about it." In a typical Trash Orchestra outing, the tempo, pace and volume is controlled by a rotating "conductor" of sorts, who blows a whistle to signal changes. "The whistle blower modulates the chaos," Thunder says. And though each member has a favorite instrument (see page 18) they're constantly switching what they play. The group is comprised of about eight or so core members, supplemented by a rotating cast of over a dozen members who drop in on practices whenever they can. Core member Whitney Wilde joined last year not for musical or activist reasons, but for physical benefit. After a serious car crash, Wilde severely fractured her arm and hand, and joined the group as part of her ongoing physical therapy. "Who knew that banging on trash could be so fun, or so satisfying?" she says. After the accident, Wilde experienced a coordination disconnection between her limbs; due to her injuries, she can no longer pat her head and rub her tummy at the same time. Her ongoing participation in Trash Orchestra helps her relearn coordination between limbs. Wilde, a bubbling blonde 52-year-old who drives a '69 bubble-gum pink Carmen Ghia named Rosie, has a background in music, but that's not why Trash Orchestra appeals to her. "I play other instruments: guitar, and I'm trying to learn ukulele. I used to be able to read music, but not anymore. And that's part of the joy of this, that you can't write it down, because it's never the same twice. "The beat is the heartbeat of the group, and everything else is what fills it in and gives it the character." Additionally, during public perform-ances, bystanders are encouraged to join along and given trash shakers - soda cans or bottles filled with beans or pebbles. Because of the ever-rotating cast and "guest stars," and the fluid nature of the music, it's impossible to compose and write down a Trash Orchestra "song." "But that's not the goal of the group," Wilde says. "We have some pieces, but it's never the same thing twice. The pieces are themes." One such signature piece is called "Train." "Pshhhoooooooooooooo," Wilde hisses, demonstrating how members use their voices to mimic the hydraulics of a train. The freight-train hopping lifestyle is another element that influences the group, which Thunder refers to as "hobo core." Says Thunder, "The people who make this happen are just an interesting group of folks. One time we asked everyone, 'How many people have ridden a freight train?' and nearly everyone had." "We're not a bunch of artsy musicians: a lot of it is about actively resisting the way things are, and trying to make change in the world." "We go where the noise is needed, but not always wanted by those who hold power." Thunder has described the group's philosophy as "rebellious insolence," and actively encourages questioning what constitutes a public space. "There's a need for people to create, to resist oppression and obnoxious laws," Thunder says. Although the group hasn't received any trouble from city officials, Thunder worries that the city is placing too many restrictions on street performers. However, Trink Praxel, principal analyst of Santa Cruz's Park and Recreation Department, says permits are not required of performers unless they need more than 20 minutes to set up, exceed a spatial limit (4 feet by 6 feet) or use an amplifier. "We want to encourage people to make the downtown area really lively," Praxel says, "but this is both a commercial and residential area. We want to make sure it's not too loud or going to late, and that it's possible for people to get by, making sure not to disrupt the flow of traffic." But first and foremost, Trash Orchestra is about … trash. The group's philosophy is similar to dumpster diving and "freeganism," the practice of scavenging and recycling refuse for alternative means, to reduce impact on the environment lessen the damaged caused by ever-increasing mass consumption. "We live in this culture of massive waste," says core member Ryan Geiss, 28, a graphics programmer. "On my cubicle I have this big picture of a landfill with 'Consume' written on it. It's to remind people that all these shiny new things they're buying will eventually turn into trash." "Trash Orchestra is a rebellion against buying things new, against doing things the ordinary way, against just sitting there and watching television. Instead, we're out there making things and doing things with people." Though Geiss was actively involved in the tech industry - his work has included audio analysis, so he's familiar with musical patterns and frequency spectrums - he's taking and e-break, and looks to Trash Orchestra as a sort of Luddite antidote to technology. "I'm going to stay away from computers for awhile," Geiss says. "I'm kind of burned out, and I just want to be a human being for awhile. That's what I like about Trash: it's so earthy, and you really use your hands to make things and play them. It's very interactive." The group has regular building sessions where they tweak existing instruments, making them more musically flexible or far-reaching, and create new ones from the ground up. All materials are salvaged or obtained secondhand. Many started out as simplistic, and grew in musical capability over time, such as Geiss' wrenchstrument which can now produce two full octaves. Wilde, an avid thrift store hunter, is also constantly creating new instruments. "I'm also working on something kind of like a xylophone," Wilde says. "It's on platform of styrofoam, and the tubes on top are cut-up pieces of old lawn chairs." And after being inspired by another local group, she now wants to learn how to play the saw - she's already got a rusty old one on hand. Though Trash Orchestra has a relaxed ethic, the members are very serious about progressing to the next level. Wilde says the group recently had a meeting where they decided certain members who were interested would enroll in taiko (Japanese drumming) and samba classes. "We're going to get some drumming from other cultures and bring that in as well," Wilde says. "We're working on developing various rhythmic patterns that serve as the backbone. Everything else is layers on top of that, and those layers will never stay the same twice." During one of the Trash Orchestra's Sunday outings, the Orchestra is assembling in their "pit" - the top level of the River Street parking garage. Thunder's car is parked nearby, a modified convertible: he literally sawed off the top of the vehicle. Serving as the unofficial Trashmobile, the backseat is brimming with junk - or, rather, musical instruments waiting to be discovered. One of the members lifts up a decrepit bucket, so banged up, so dented and rusty that it barely resembles its original incarnation. "I love that bucket," Thunder says, with genuine affection in his voice. "That is such a great bucket." "This sounds really good too," says Geiss, the renounced computer whiz, as he offers up a dented motherboard. "Hey, hand me the funky metal thing," someone asks. After a few minutes of preparation, the group is ready to head down to Pacific Avenue for a public performance. Collectively, they hoist their junk and break into a march, their footsteps echoing through the parking garage, mirroring the beat of the bass drum recycling bins. As they form a line and stroll down the ramp and through the alleyways of downtown Santa Cruz, it's like freegans meets Reservoir Dogs. They play while marching, working their way through the crosswalk and finally settling next to a giant metal fish sculpture at Pacific and Cooper, just across from the Cinema 9 movie theater. Melding instantly with the lazy, strolling feel of downtown Santa Cruz, Trash Orchestra is a hit. Several bystanders of varying age break into spontaneous dance. Little girls in pink dance along, swirling sparkling butterfly creations obtained from street vendors; couples stop to stand and watch, arm-in-arm. A father parks his stroller directly in front of the group and reaches in to unbuckle his toddler, who is wriggling with delight. Wilde walks over and hands them one of the Trash shakers; for a good 15 minutes father and son sit, sharing the shaker and clapping along. A few homeless men approach the group, but instead of being shooed away, they're handed drumsticks and chopsticks and are encouraged to join in. One of them rattles up a staccato beat on the fish sculpture, blending in with the families watching and children dancing. Off to the side, a clean-cut looking gentleman in a button down shirt is using two pennies to drum up rhythms on a metal trashcan. Undoubtedly, its contents hold musical treasures aplenty, but no one stops to salvage - they're all too caught up in the beat of the moment. To listen to samples of the Trash Orchestra online, visit www.trashorchestra.org. Sarah Klein is editor-in-chief of Alternate 101. Send comments to sklein@alternate101.com.